I crossed my arms and looked up at the ceiling as they strapped me onto the backboard and then all at once they lifted me up. It was like one of those dreams where things happen again except it wasn’t a dream it was real, but this time I was a mock patient as all of us, students, learned how to transport patients so we would be comfortable doing this when we soon set out on our own as practicing EMT’s. I’ve really never had flashbacks of that part of the accident, I assume it’s because I don’t remember most of it. The only really strong memory I have is trying to look around but all I could see was what was up above me because my head was strapped into a collar. I’ve come a long way. I’m not a little highschool freshman that’s overly excited about everything, I’m a soon to be college freshman with a whole lot of nervousness. Looking back on these last 4 years I wonder what they would have been like had my accident never happened. It would be naive of me to say that I would turn out to be the same person, my accident has shaped just about all of my characteristics. Maybe I would have ended up being that crazy art student I wanted to be. Maybe I would have been a little more adventurous and sneaky. Maybe I would have lived a little more. I know one thing though, I wouldn’t be who I am right now. These last four years have been crazy. Crazy is really the only way to explain it. So much has happened in such a short but long period of time and now suddenly it’s all over, it’s done and now, well here I am. I wonder if these next 4 years will be like the last 4, who knows what the earth will throw my way but I’m so ready for it. I hope I learn to live a little more, to not always steer away from the adventures but to chase after them sometimes. I hope I understand the definition of self discovery and truly figure out the idea of self love. I could pretend that just about everything I’ve learned and done these last four years hasn’t been influenced by my accident but I would be lying, like really humongously lying. I’ve grown though and now instead of it hanging over my head like a rain cloud it just sometimes appears. Instead of seeing myself as the girl in the cheerleading accident I see myself again as Merideth, only occasionally reminded of the accident when I’m faced with difficult tasks. I don’t not do things anymore because I’m afraid of the possible reprocusions on my body because I’m just too weak, instead I join in. I no longer sit on the sidewalks, I run on them. I still have POTS but POTS doesn’t have me anymore. I’m about to walk into the real world, and I’m not going to be the sick girl anymore, I am going to be the strong girl that knows the hardships of living in a sick body but has walked across the bridges and is on her way to the other side. This blog has served me so well. I’ve connected with so many of you and you’ve all been so good to me in ways I’ll never be able to repay. I don’t think there are really words to explain the feeling but I am an EMT student now, the patient isn’t my only title, I will soon be the caregiver too and I can’t wait to share with you all the joy this brings me as I’m beginning to feel it already. I said goodbye to my main Doctor here in my state last week. She released me from her care, I hugged my nurses, I said my goodbyes and I walked tall out of the office. I now have one main Doctor who I will see every nine months but other than that I am on my own. As many of you know I was planning on writing a book and going to print with it early next fall, at the time writing was therapeutic, it helped me heal in so many ways but for now it’s something I’m going to put on the back burner. Instead of digging deeper into what these last 4 years have been, I am going to focus on all the potential these next four years have in store. Who knows maybe someday I’ll come back to share my story but I believe that my story really isn’t over yet, I’ve done the sick part but now is when it gets really exciting and my adventures begin. Not everything can be done in a day, some things take time, even years. I promise that if you stick it out thougj the ending will be everything you wished for and more. I am not a superhero. 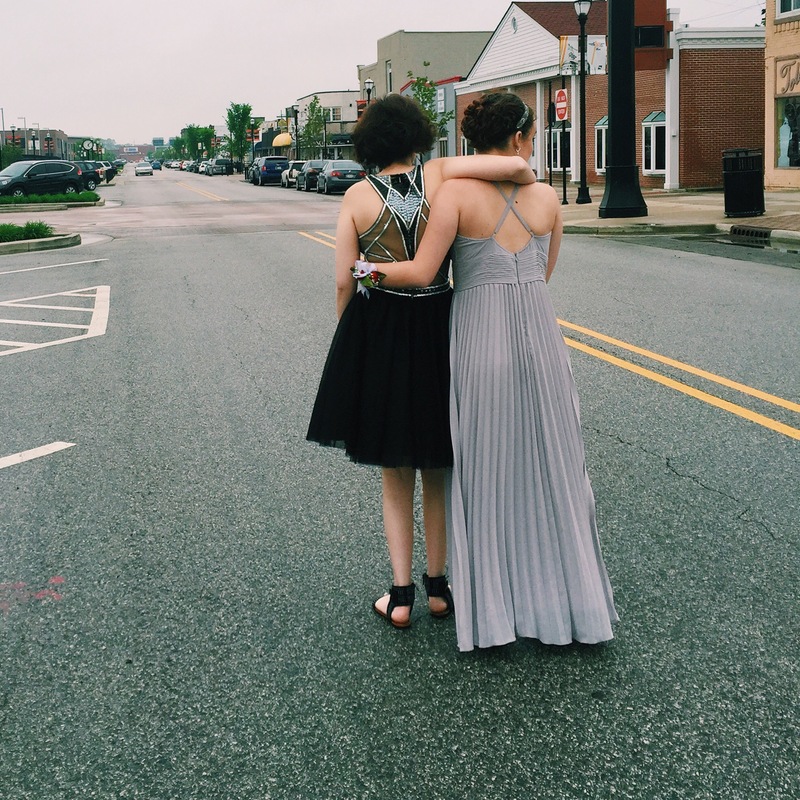 My friend Mia invited me to her prom this past weekend. Mia was born with a brain tumor and has gone through surgery that has resulted in the removal of half of her brain, she underwent radiation and proton therapy. A few years ago Mia suffered a stroke due to the radiation that left her with weakness on one side of her body. I didn’t know Mia before her stroke, I’ve always known Mia with her hot pink wheelchair and her spunky drive and I love her just the way she is and wouldn’t change anything were i given the chance. Mia invited me to go to her prom this past weekend and I was absolutely honored that she chose ME to take with on her special night. I noticed little things throughout the night though, when I helped Mia to the bathroom and I went into the stall with her to help lift her from her chair others watched. When I helped Mia cut her food they watched. When I lifted her up out of her chair so that we could dance together they watched. All of these things, the “helping” for Mia I am used to, it is not a chore to me it is an honor. Helping Mia is a privilege, making it possible for us to do exciting things together is tremendously worth every second of it. I’m so thankful my sweet friend chose ME to enjoy the evening with her. The thing about all of this that really “shook me up” though was what followed. How I was praised for being such a “genuine soul” or such a “wonderful young lady” for assisting MY friend. I am not a superhero, I did not break walls and slash barriers, I didn’t eliminate the stigma this society has for people with “disabilities” I simply went to prom with my friend and we did what we would do anywhere else we go together we just simply did it looking like two BAD B!+€he$ (sorry mom, sorry momma Keri) because let’s be honest we slayed that dance floor. I hope that someday I will live in a society where it is customary and normal for everyone to make the extra effort to assist those with “disabilities” so that they too may enjoy everything everyone else gets to. Maybe someday it won’t even be an extra effort to hold a door so a wheelchair may fit through, maybe it will be customary to hold a door for everyone regardless of wether they are in a chair or not. I want to live in a world where we stop altering our approaches to people because of their abilities. I want to live in a world where my best friend can be different than me and it not be viewed as an act of charity or an attention seeking deed. I want to live in a world where people compliment my friend and I and look beyond our differences to see our commonalities because we have far more of those than things that seperate us. I hope you start to make the extra effort with me in an attempt to make it no longer “extra.” I hope you join me and welcome our friends with special abilities so that they can feel included and capable of doing anything they wish. Limitations and Pre-Perceived judgements only exist because we as a society have created them. I am not a superhero, I am just a girl with a best friend making it possible for us to do best friend things.